BoxingScene.com has been advised that former featherweight champion Nicholas "Axeman" Walters (26-1-1) will return to the ring on August 19th against Arturo Santos Reyes (19-8) at the Pinnacle Bank Arena in Lincoln, Nebraska. The fight will take place underneath the super lightweight unification bout that pits WBC/WBO champion Terence Crawford against WBA/IBF/IBO champion Julius Indongo. ESPN will televise the main event along with the Oleksandr Gvozdyk-Craig Baker light heavyweight co-feature bout. Walters last fought in November when he was dominated by WBO super featherweight champion Vasyl Lomachenko. 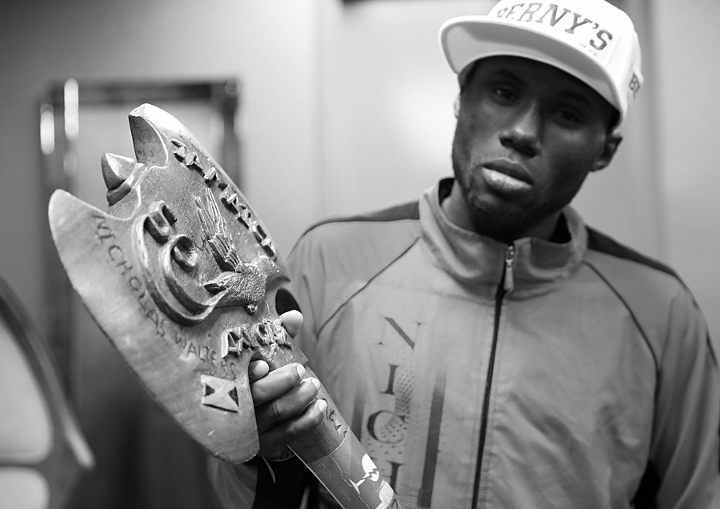 The Jamaican burst onto the US scene in 2014 when he stopped Nonito Donaire to capture the WBA featherweight title. The undercard is loaded with familiar names and features the return of former interim super lightweight champion Mike Alvarado (37-4) against Sidney Sigueira (26-12), former heavyweight title challenger Bryant Jennings' (19-2) Top Rank debut against Daniel Martz (15-4-2), 24-year old unbeaten super lightweight/welterweight prospect Mike Reed (22-0) against Robert Frankel (35-17-1) and the third pro fight of 2016 US Olympic silver medalist Shakur Stevenson (2-0). As previously reported on BoxingScene.com, heavyweight contender Dillian Whyte will also see action on the card when he faces Malcolm Tann. The 29-year-old Whyte, who last fought in December when he edged out Dereck Chisora in a Fight of the Year candidate, was originally going to face faded former title contender Michael Grant. The same Grant many will remember faced Lennox Lewis 17 years ago. Those plans were scrapped when the fight received heavy scrutiny for being a mismatch. Tann (24-5, 13 KOs) is a Phoenix, Arizona based 15 year pro who has faced the likes of Chris Arreola and Alexander Dimitrenko. [QUOTE=angkag;17928827]ok but please remember where I live. No labial tickling of the gonad region down here - sanitation regs. you understand. [/QUOTE]good sportsman you are! He needs to get active if he wants to succeed.